The holidays are a time to feel joy and love, to give yourself the time you need to relax and be with loved ones, but also a time to reflect upon the things that matter, that sustain us in this crazy life. While the commercials on TV and barrage of print advertisements would have you think it is all about buying the “perfect” gift, the truth is, the special ingredient for a joyous holiday is connection. To me, the greatest gift we can give ourselves and others is to say thanks for those meaningful connections to people in our lives. Besides family and loved ones, friends and neighbors, there are countless others in our lives with whom we feel a special kinship that we can and should acknowledge over the holiday. In the busy and frantic world in which we live these encounters are often what sustain us—turning a big city into what can feel like small town familiarity. Unfortunately, there are many people in our day to day lives that are without the support of friends or family. What a different world it could be if everyone made an effort to connect in some way to someone who is lonely or lacking in support. I am grateful for the myriad of connections I make daily in my travels in NYC. Without those familiar “acquaintances” the journey would feel a lot longer. I am thinking of Wilfredo, the bodega owner I have known for years, near my ENACT school in the Bronx at 184th Street. It is not just that he warms the milk for my coffee; it is that he knows my name. It is the connection we have had over the years. It is our history. We have shared a lot of stories and a lot of changes in the time we have known each other. I have known him since before the complete renovation of his store. I know that he sells sandwiches for a dollar so that kids from the school can eat a healthy and affordable meal. I know that he is the guy who will let you pay him later if you’re short on cash one day. I have credit if I need it—good to know. These are the little things that sure make a cold winter morning a little warmer. This time of year I think about how thankful I am that I have just about the coolest job in the world. 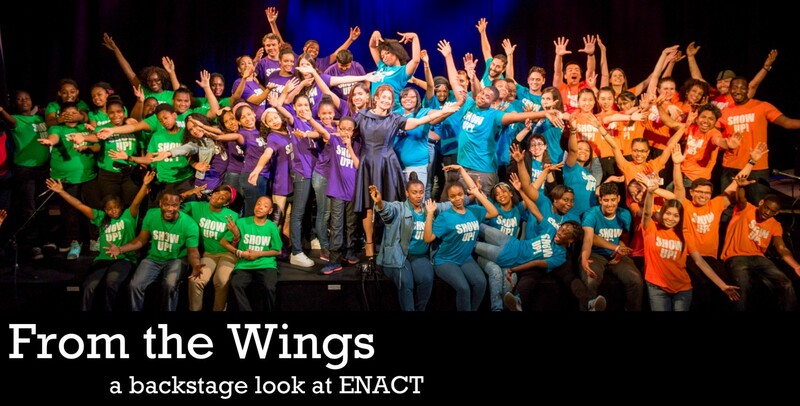 I am a teaching artist (and for many years the Director of Training and Research) for ENACT. I create original, theater-based workshops that use theater as a tool for relationship, to create community, and to get groups talking about their challenges and concerns. It is my goal to create a classroom community that is fun and supportive, non- judgmental, and relevant to kids’ lives and experiences. I want our workshops to be a space for students to feel connected. The teaching artists and drama therapists strive to make this connection through our scene work. We aim to play scenes that resonate deeply, that will reflect our students’ needs and challenges. During the course of our brief time together each week, we leave both the past and any concerns about the future (a test, the Dean’s office, a fight in the lunchroom), and enter the present through the portal of a fun theater game. We all board a train in the form of a scene and take a journey to some familiar place. Once there we examine conflict in the hopes of looking at it in a different way. We emerge from our journey armed with better ways to manage our feelings, a clearer understanding of other’s needs, or recognition of who we can reach out to for support in times of need. We know the scene works when the students share similar feelings and experiences from their own lives.Helping kids identify their feelings and connect about situations that may feel isolating or overwhelming is a huge part of the work. I often think about the children we serve at ENACT and our relationship with them. I am so thankful to all of the students over the years with whom I have connected. So many beautiful kids who have shared their thoughts and feelings, who have opened up despite their best resistant intentions and changed throughout the course of the year. I am so grateful to my fellow teaching artists and to Diana and the ENACT staff, past and present, for their dedication, inspiration, and trust that what we do matters. I am forever grateful to the teachers and school administration who invite us to work with their students, parents, and staff. There has never been a dull moment in this work and that in itself is a present. I think the perfect gift for the holidays is to be able to tell people how much they matter in our lives, in whatever capacity. The small act of recognizing connection can bring joy and meaning to lives. I know this warmth personally; I have felt it brighten my day. This season I hope to be someone that gives a gift that sustains and connects us to each other. It is a gift everyone can afford to give – appreciation and validation. Emilie Ward is a Registered Drama Therapist and a Licensed Creative Arts Therapist. She has been with ENACT for almost 20 years and has contributed significantly to the development of the curriculum and current method. She has been recognized for her work at ENACT by the North American Drama Therapy Association’s Research Award and was a co-founder of Drama Lab NYC, a therapeutic theatre company pioneering new and exciting theatre around the topic of mental health/mental illness. This entry was posted in Drama Therapy, Fieldwork and tagged connection, empathy, holidays. Bookmark the permalink. I am grateful for you Emilie Ward, my friend, my colleague, my teacher. I am blessed to have you and your wonderful company in my life to remind me to keep giving back – for every time I do, I am rewarded in unbelievable ways. Thank for this lovely holiday message. You are an angel.